It turns out that 2012 was a pretty good year economically in the United States. In 2011, the US GDP, or Gross Domestic Product, increased by 1.6 percent. By comparison, GDP rose by 2.6 percent in 2012. Especially when considering the size and economic clout of the US, this is a sizeable number. Growth in GDP during 2012 can be largely attributed to GDP growth in some of the largest states in the US. It makes sense that these large states do much to drive the economy. However, these weren’t the only states to experience GDP growth. Most of the states on this list experienced high population growth in 2012. Population growth is generally one of the primary factors associated with growth in GDP. And remember, growth in GDP ought to be a factor considered by those who are trying to decide which state or states to focus their entrepreneurial efforts in. So without further ado, here are the top five fastest growing state economies in 2012. In 2012, Minnesota had a banner year. This northern territory enjoyed the fifth highest growth in GDP at 3.5 percent. Simultaneously, Minnesota was home to the lowest unemployment rate in 2012, with just 5.6 percent of its workforce reportedly out of work. Much of Minnesota’s GDP growth can be tied into growth in the finance and insurance industries. However, it ought to be noted that this GDP growth did not translate into heavy job growth; during 2012 Minnesota was in the middle of the pack when it came to generating new jobs. Washingtonians had much to be happy about this past year, at least from a growth standpoint. GDP growth in Washington was an impressive 3.6 percent in 2012. Much of this growth is credited to Washington’s increasing influence in the information sector. Growth in information sector businesses was responsible for a third of all GDP growth in Washington state during 2012. Washington’s neighbor and rival Oregon also made it high on the GDP growth list, boasting 3.9 percent GDP growth this past year. Durable goods manufacturing is responsible for much of Oregon’s GDP growth. Much of this durable goods growth comes from the presence of the computer part manufacturer Intel in Oregon. The company employs 17,000 people there. Oil and gas are huge for GDP growth. So too is population growth. 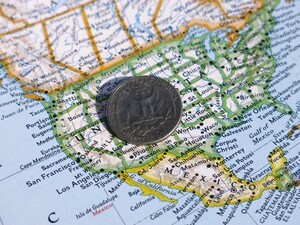 Texas experienced in an increase of all three in 2012 and had a GDP growth rate of 4.8 percent as a result. Texas is already the nation’s second largest economy, and these new numbers do nothing but bolster that status. In 2012, North Dakota’s gross domestic product grew by a whopping 13.4 percent. Unsurprisingly, North Dakota was also the leader in population and employment growth this past year. To a large extent, all of this rapid growth can be traced back to the oil boom that has recently hit the state. North Dakota recently became the second largest oil producer in the US, second only to the state of Texas. Still, investors ought to be careful – oil revenue won’t last forever! About the author: Justin blogs about business news and how to found and market a business on behalf of Kwikkerb. He also provides information on the Kwikkerb business opportunity.